Hyatt Regency Huntington Beach Resort in California is a fun getaway for couples as well as families, offering beautiful ocean views, elegant accommodations and fun activities. The property features Spanish-inspired architecture, a relaxing spa, an outdoor pool, access to the sandy shore and Camp Hyatt for kids. Local attractions include Disneyland, Disney California Adventure, golf, Aquarium of the Pacific and Catalina Island. Take surfing lessons on the beach, explore the area by bike and visit Orange County Museums and Monuments on your vacation. Indulge in pampering and relaxation at this unique spa designed with Mediterranean and Pacific influences. The 20,000 square foot spa is an oasis of relaxation with its waterfall showers, whirlpools, sauna and steam rooms. Work out at the fitness center which is equipped with all the latest work-out technology. If you want to enter without a treatment, the Day Spa pass costs $50. Perfect for families with kids, Camp Hyatt is offered to ages 3-12. Activities include arts & crafts, beach and pool fun. Each day is designed around a specific theme. Morning session with lunch is $60. The kids' club is offered year-round, giving you a chance to relax on the beach or at the spa while kids participate in diverse activities. Slyders Water Playground is perfect for families with kids. Children can slide down three water slides and splash around in the pools. In the evenings, sit next to a fire pit and roast marshmallows. There are 517 guest rooms with a private balcony or patio, luxurious down comforter and plush robes. The hotel is a great destination for multi -enerational family reunions where everyone can get the right rooms and suite for them. Interconnecting rooms are available to families as well. Resort View King : Measuring from 436 to 465 square feet, Standard rooms have a view of the courtyard and pond. The room can accommodate up to 4 guests. A similar configuration is offered with two Queen beds. Accessible Rooms: The room is Americans with Disabilities Act-compliant guestroom, complete with two queen beds and accessible tub. Choose from Queen, King Shower and King Tub rooms in this category. Regency Club Rooms: If you book one of these rooms, you will get access to a private lounge serving complimentary continental breakfast and hors d'oeuvres. Most of these rooms have oversized balconies with Huntington Beach views. Choose from 1 King or 2 Queen beds. Deluxe One King: Measuring 523 to 539 square feet in size, these rooms offer additional space. Governor's Suite: The resort offers 7 Governor's Suites, offering 1,280 square feet of living, sleeping and dining space. Each suite has 1.5 bathrooms, including a master bath with jet tub. If you are planning a luxury family vacation in California, book one of these amazing suites. Sunset Suite : These 10 suites are the most spacious. They offer 900 square feet of living and sleeping space, plus two full bathrooms. The resort offers diverse dining, both refined and casual. Watertable: Enjoy Coastal cuisine at this innovative contemporary American restaurant. The restaurant serves a diverse selection of wines, cocktails and local brews. Pete's Sunset Grille: Try the famous Fish Tacos and Strawberry Margarita Crunch at this unique restaurant. Mankota's Grill : Dine poolside at this casual green with views of the Pacific Ocean. Have cocktails in the evening and roast S'mores with kids at this family-friendly restaurant. Surf City Grocers: Pick up snacks to go, ice cream and coffee at this store. Tower 15 Pizzeria : Whether you want to try just a slice or enjoy a family pizza, this is the place to go. The eatery also serves sandwiches, pasts, salad and other items. You can order delivery or get take out if you are in a hurry. Red Chair Lounge: Sample boutique California wines, signature cocktails or martinis. Live entertainment is offered Friday and Saturday next to a cozy fireplace. Plan the ultimate beach wedding with the help of the resort wedding planners. The property offers 100,000 square feet of indoor and outdoor flexible function space, including three ocean view ball rooms and ocean-facing courtyards. Vista Ballroom:This romantic ballroom has floor to ceiling windows that overlook the Pacific Ocean and can accommodate up to 220 guests. Huntington Ballroom: The ballroom has an open terrace, private foyer with ocean views, and can host a reception of up to 400 guests. Fountain Ballroom : This ballroom accommodates up to 120 guests features grand decor. Mariner’s Ballroom : Host a wedding for up to 400 guests in this unique ballroom. Grand Ballroom : Tall ceilings and wall sconces create a romantic setting in this unique ballroom which features a grand foyer and terrace which overlook the ocean. Room rates start at $290 per night. 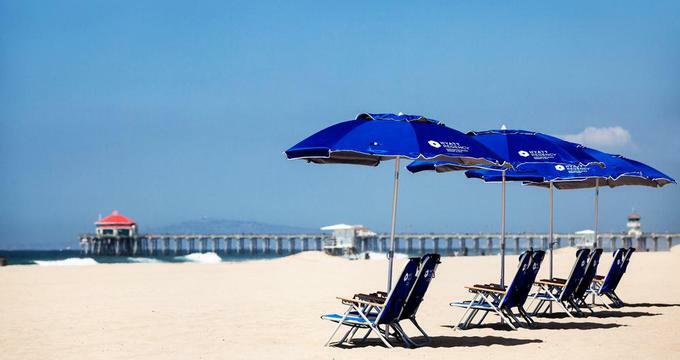 Find more weekend getaways from San Diego and family trips in California. You may also like the Langham Huntington Hotel & Spa.